At the beginning of this year I launched into full-on organizing mode. I don't know that I do spring cleaning as much as January cleaning. 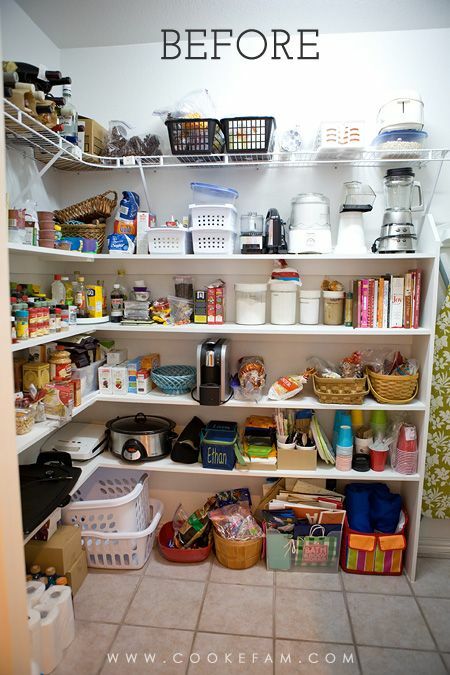 I have an urge after Christmas to take stock of what shape our closets and storage spaces are in. One of the projects I've been itching to do for a while is our pantry. It was not in bad shape, really. 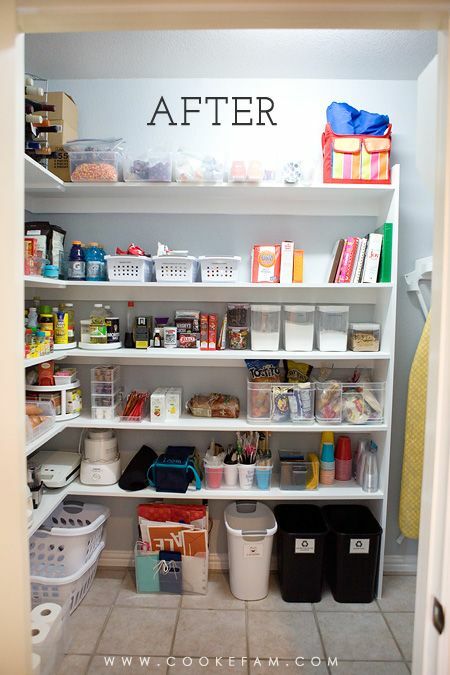 But considering I am in there about 50 times a day, I just wanted a little more organization and functionality. Plus, I knew it was time to clean out some things too. It is so hard to show a small space in photos, so there are about a million of them from every angle. 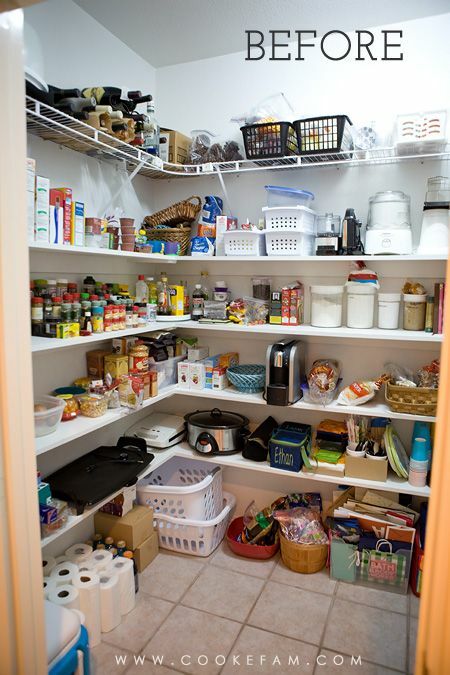 However, one of the things this pantry has going for it is space. It's not tiny and it's one of the things that sold me on this house. 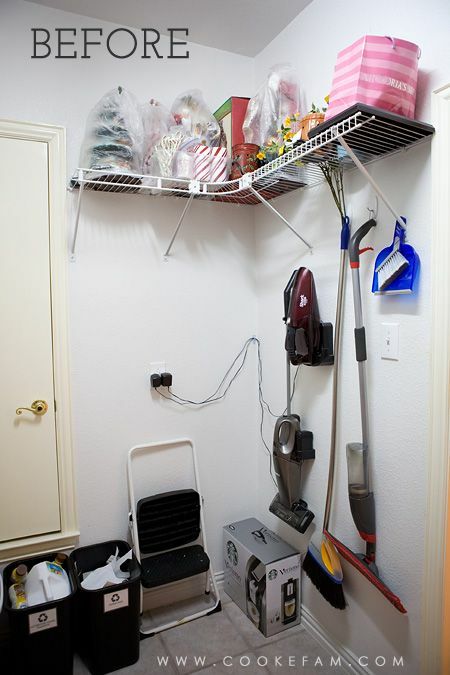 This corner was just a huge waste of space.And more wire shelving. I had three things I wanted done to the pantry: 1) paint the walls (because everything is coming out anyway and there were old nail and screw holes...why not?). 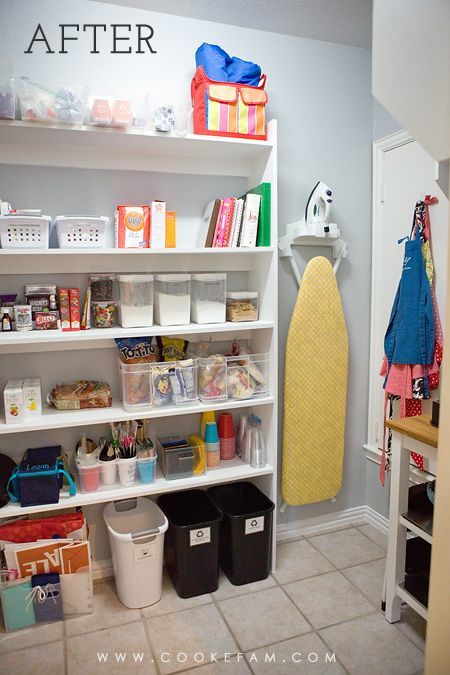 2) replace wire shelving with wood. 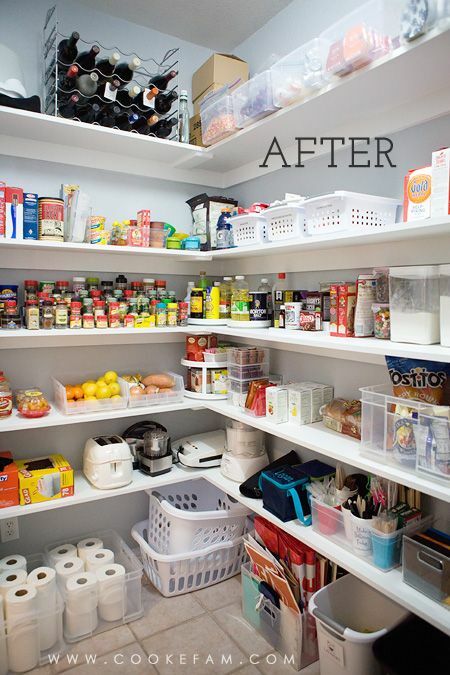 3) fix organizational issues on shelves with more containers, tools, etc. 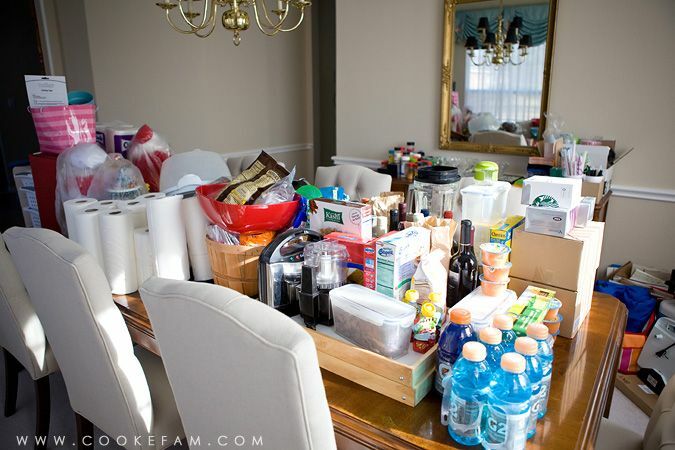 The process started by turning my dining room and kitchen surfaces into dumping grounds for all pantry items. 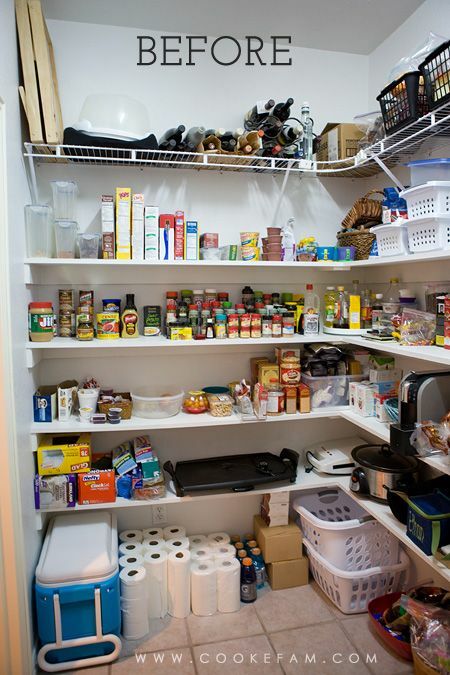 Seriously, when it was all spread out like that, I could not believe how much stuff fit in there. 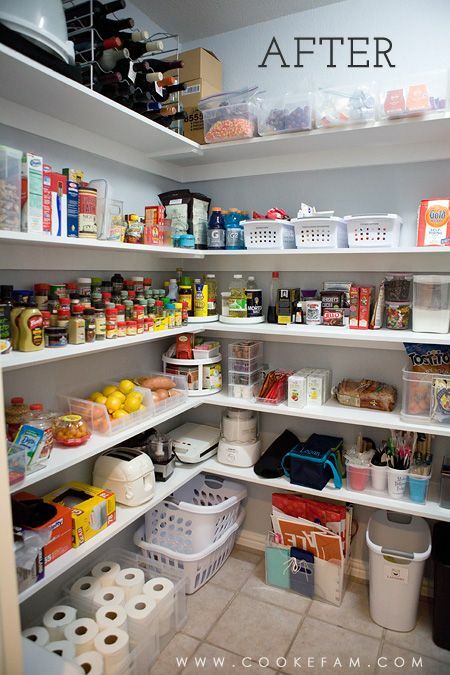 We were without our pantry for about a week, so it was a bit comical when I'd try to cook...I had to clear counter space, find my ingredients (no small task), and then kick myself every time I walked into the empty pantry out of habit (which was a lot). It was an interesting week. I'm skipping the "during" photos because there's already a million photos in this post. But, the walls were painted (a soft, bluish-grey), the wood shelves were added and painted, and everything was loaded back in. As I was deciding what would go back in and where, I took the opportunity to get rid of (throw away/donate) several things that had either expired or I just never used. Putting the pantry back together took me a good 2 days (on and off, of course) and it was probably the most fun I've had this year so far. I had the best time planning the space and putting everything in it's place. Some things got new containers, some got moved around. But I had the advantage of 3.5 years using this space to know how I wanted things. New wine storage was on my list and that was accomplished. 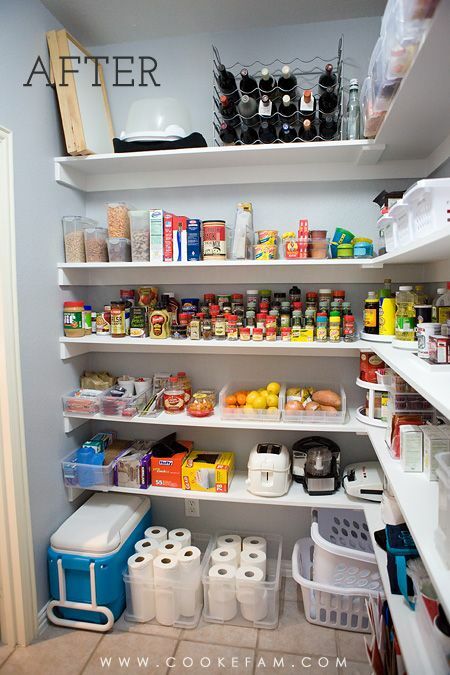 The lazy Susans in the corners of the shelves really maximize the space and allow me to see things easily. ALL my spices got moved into here. I used to keep my "most used" spices in one of the kitchen cabinets, but I found it easier to have them all in one place so I'm not having to think about where a particular spice is. And I alphabetized them. My cookbooks were trimmed down to the essentials and baking supplies got their own containers. 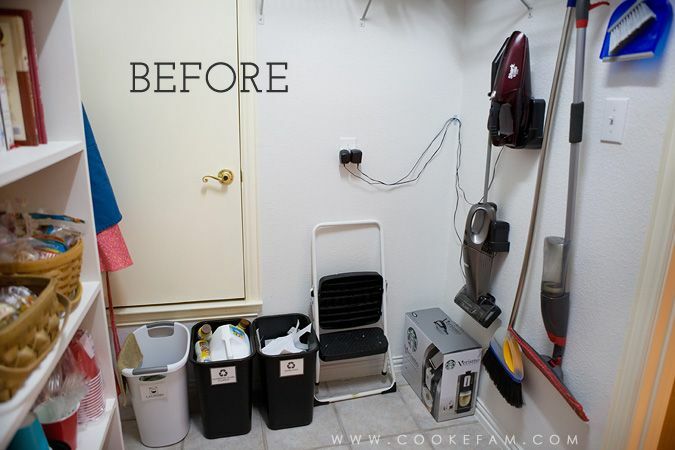 Recycle bins and laundry bin were relocated to below the bottom shelf because the corner in which they use to reside got the biggest makeover, in my opinion. This corner now has a kitchen card (from Ikea) and the new wooden storage shelf (for holiday stuff that can't go in the attic). I love having some of my most used appliances on the cart so I can grab them quickly and easily. Oh, one of my favorite things I added are the fruit and veggie bins. I didn't have anywhere to put them before and I love having them so visible and accessible now. I think I should note that I take most things out of their packaging before putting them in the pantry (or fridge, for that matter). I hate packaging....it takes up so much room and then you have to unwrap things when you need them. 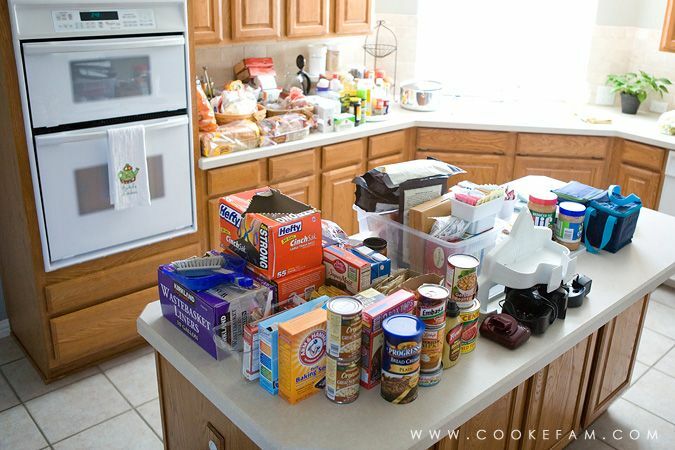 I prefer to take a few more minutes after going to the grocery store and tackle it all at once. 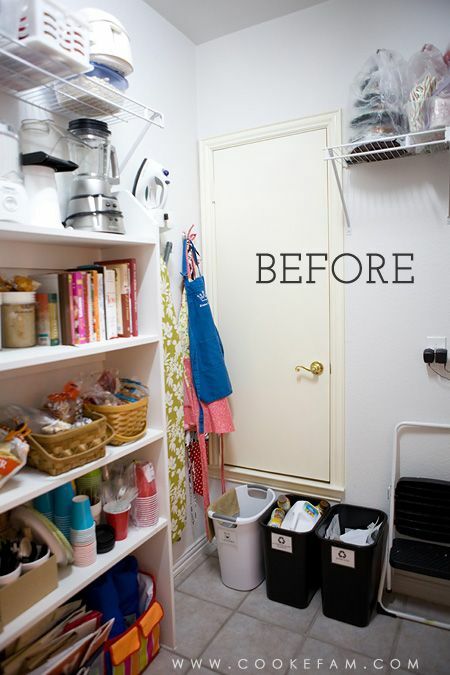 I seriously have pantry envy! 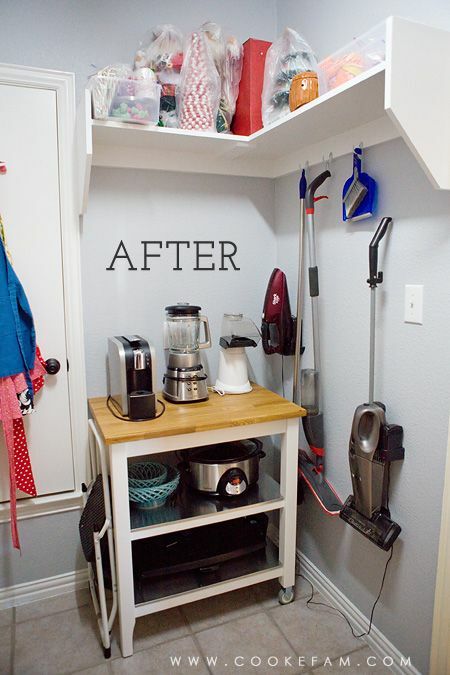 we have a closet and it's always a mess!